The AirPro MetaLite personal air sampler is a compact, portable instrument used for collecting air samples of dust, asbestos, metals, gases or vapors. The MetaLite sampler is typically deployed in industrial hygiene, abatement, environmental, and laboratory programs utilizing application-specific filtering devices for particulates or sorbent tubes for VOCs. The AirPro MetaLite offers the advantages of one-button simplicity or advanced integrated programmability in one lightweight package. In its simplest form, merely turn the MetaLite on and begin sampling. The AirPro MetaLite's advanced electronics remembers the last programmed flow setting and resumes sampling immediately. It even automatically logs the run time in its non-volatile memory for later audit trail confirmation. More advanced features of the MetaLite include an integrated LCD display for time, flow and fault indication, delayed start time and preset run time. 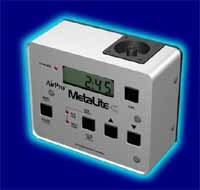 With simple electronic flow adjustment, the AirPro MetaLite offers convenient one-handed flow calibration. Combine the AirPro® MetaLite with a DryCal flow calibrator and you have the most advanced sampling package on the market. The rugged, lightweight stainless steel case provides exceptional protection against EMI and RFI interference at a weight comparable to that of plastic cased samplers, and the anti-tamper plate guards against dirt and splashes, but can be easily removed with a screwdriver. The MetaLite can be purchased with either Nickel Cadmium (NiCad) or Lead-acid batteries. The MetaLite "Standard" NiCad pack offers light weight, while the MetaLite "Pb" Lead-acid battery offers longer shelf life between charges. Either option offers exceptional sampling capabilities.